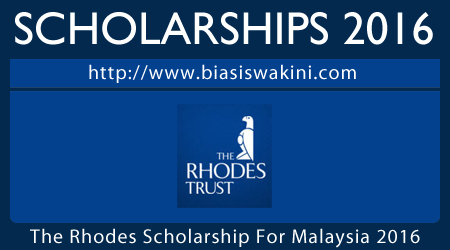 Welcome to the information page about the Rhodes Scholarships 2016 for Malaysia. The Scholarship is generously supported by Yayasan Khazanah. Applications for the Rhodes Scholarships for 2017 for Malaysia will open here shortly. Selection of the Rhodes Scholarship for Malaysia is by a selection committee drawn from diverse professional and academic backgrounds, including both Rhodes Scholars and non-Rhodes Scholars. 3. the application criteria and procedures specific to Malaysia (available when applications open). If you are a referee, guidance for entry in 2017 will be available shortly. 0 Komentar untuk "The Rhodes Scholarship for Malaysia 2016"